Visual Studio Code>Programming Languages>JinjaNew to Visual Studio Code? Get it now. This extension adds language colorization support for the Jinja template language to VS Code. 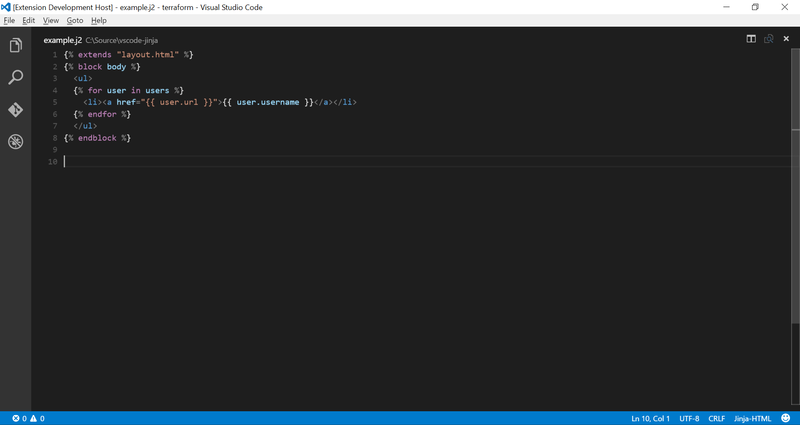 First, you will need to install Visual Studio Code 0.10. In the command palette (cmd-shift-p) select Install Extension and choose Jinja. The downside of the Jinja language is that there is no defined file extension and as such, there is no way to detect it automatically in all cases. This extension will look for it in two file extensions - .html and .j2. The .j2 file extension is heavily used with Ansible which uses the Jinja2 engine underneath.